New Voices in Japanese Studies is a non-commercial, open-access academic journal. It is published in-house by The Japan Foundation, Sydney with the aim of supporting emerging researchers with ties to Australia and New Zealand. In principle, New Voices in Japanese Studies publishes one issue annually. 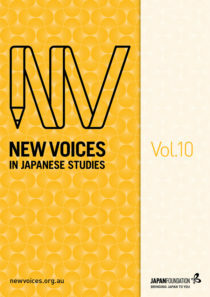 New Voices in Japanese Studies was formerly published as New Voices. Volumes 1 to 6, published under the title New Voices, are registered under ISSN 2204-194X. Volumes 7 and beyond, published as New Voices in Japanese Studies, are registered under ISSN 2205-3166. Each volume of New Voices in Japanese Studies is produced in collaboration with an academic guest editor. The Japan Foundation, Sydney gratefully acknowledges the assistance of guest editors in making these volumes possible. New Voices in Japanese Studies is a refereed journal. All submissions are double-blind peer-reviewed by at least two independent academic experts to meet the Australian HERDC requirements for refereed journal status, and also benefit from feedback from the academic guest editor. Editorial advisory board members differ for each volume, depending on the discipline and subject area of submissions. Editorial board members for past volumes are listed at the links below. The Japan Foundation, Sydney gratefully acknowledges the invaluable time and expertise contributed by editorial board members in support of early-career publication by emerging researchers. To ensure greater access to the papers in this journal and support interlinking with other scholarly work, New Voices in Japanese Studies is a member of Crossref. New Voices in Japanese Studies is also archived in Pandora, the National Library of Australia’s web archiving service. New Voices in Japanese Studies is committed to ensuring that all papers published are original contributions to literature in their field. Originality is vetted through supervisor recommendation at the submission stage and a rigorous peer review process. Beginning with Volume 10, the journal also employs Ithenticate plagiarism detection software to ensure the originality of published work. New Voices in Japanese Studies is committed to ensuring that all papers published here represent original contributions to literature, and all third-party sources are credited appropriately. Papers that do not meet these criteria will not be published. New Voices in Japanese Studies is committed to open-access publishing. All content in New Voices in Japanese Studies is free to access, and no publication fees are required from authors. In the spirit of furthering open access, all content in New Voices in Japanese Studies will be licensed under a Creative Commons CC-BY- NC-ND 4.0 licence starting from Volume 8. New Voices in Japanese Studies is published by the following team. The editors wish to thank Jon Zhu for logo and template design, and the amazing Kevin Vo for ongoing assistance with article layouts, web development and design.